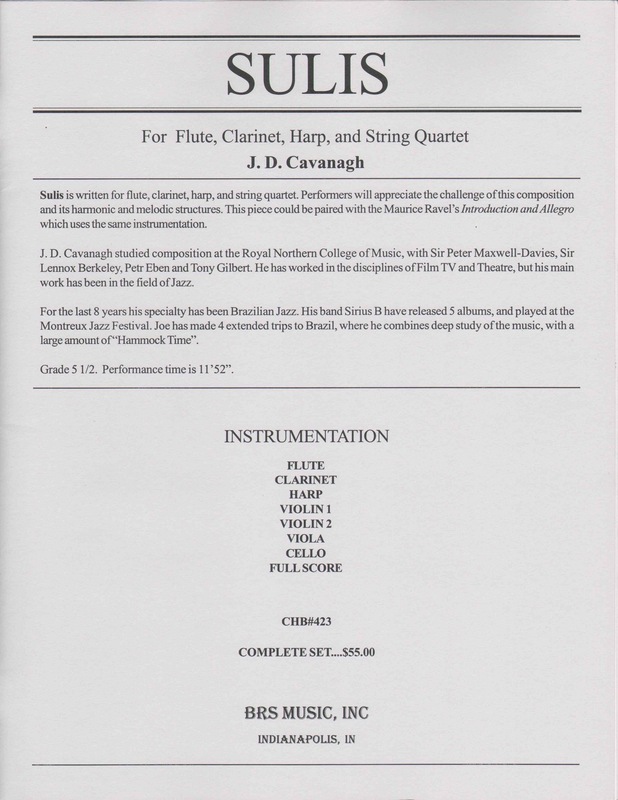 Sulis is written for flute, clarinet, harp, and string quartet. Performers will appreciate the challenge of this composition and its harmonic and melodic structures. This piece could be paired with the Maurice Ravelís Introduction and Allegro which uses the same instrumentation. J. D. Cavanagh studied composition at the Royal Northern College of Music, with Sir Peter Maxwell-Davies, Sir Lennox Berkeley, Petr Eben and Tony Gilbert. He has worked in the disciplines of Film TV and Theatre, but his main work has been in the field of Jazz. For the last 8 years his specialty has been Brazilian Jazz. His band Sirius B have released 5 albums, and played at the Montreux Jazz Festival. Joe has made 4 extended trips to Brazil, where he combines deep study of the music, with a large amount of ìHammock Timeî. Instrumentation: flute, clarinet, harp, string quartet.